We are very pleased to announce that Kevin Millward has been appointed as Course Director. Kevin has been potting for over forty five years. Following training at art college in the late 60s and early 70s, he spent the next four years working in studios perfecting his production throwing skills before moving on to industry on the technical side. Three years later he set up his first studio and also taught at the local college, which led to thirty five years of teaching at Universities throughout the UK. 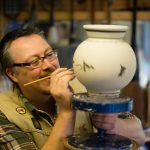 Kevin has acquired an unrivalled reputation for his workshops, seminars and demonstrations on all aspects of making for potters groups and suppliers of ceramic materials throughout the UK and Europe. Over the last ten years his great understanding of industrial processes has allowed him to be involved with the design and development of some of the best-selling, industrially produced tableware in Europe and the United States. This has always run parallel to producing his own work that can be found in leading galleries and museum collections as diverse as the Wedgwood Museum and the Japanese Embassy in London. Almost from the start of his potting career he has been involved in a variety of TV work such as game shows, Time Team, Coronation Street and children’s programs and most recently as the Programme Consultant to ‘The Great Pottery Throw Down’. Kevin also regularly contributes to books and articles for ceramics magazines. In 2017, A&C Black will publish his book on Surface Decoration. 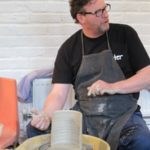 Kevin’s expert and supportive one-to-one tuition will be augmented by masterclasses in specialist areas, taught by visiting master potters, alongside the best of contemporary and international makers. We have an amazing list of potters who have offered to pass on their skills and knowledge at the college, including Svend Bayer, Clive Bowan, Magdalene Odundo, Walter Keeler and Takeshi Yasuda. Helen is an education and management professional with a strong arts background. She has worked for over 14 years in the education sector within Stoke on Trent. Spending the last 10 years specifically within Further Education teaching and leading a wide range of Creative and Performing Arts qualifications. Most recently Helen was a Senior Area Leader within the college management team of a local Sixth Form College leading a range of successful teams and managing all aspects of delivery and administration relating to them. Helen graduated from Staffordshire University where she studied 3D Design:Crafts focusing specifically on Jewellery and combination materials. She also has post graduate qualifications in Art, Design and Management. She is also a keen hobbyist potter. Richard’s initial study in Art and Design Foundation was at Staffordshire University and from there he went on to achieve a BA Hons in 3D Design at Manchester Metropolitan University where he developed a life long interest in oriental ceramics and reduction firing. He is a full time professional potter and selected member of the Craft Potters Association. Living and making in London, Richard has 20 years experience in adult education, teaching vocational and recreational evening classes, BTEC and Art Foundation. He has experience working as a ceramic technician, and as Head of Department during this time. Specialising in thrown porcelain decorated in cobalt blue pigments, he exhibits at most of the major ceramics events around the UK and his work is regularly shown in galleries and exhibitions around the country. Has also exhibits internationally and has had shows in Taiwan, Hong Kong, Singapore, Europe and America. Returning this year to Staffordshire and the Potteries, where he grew up, he now runs a working pottery at Hempmill Brook just outside Market Drayton.